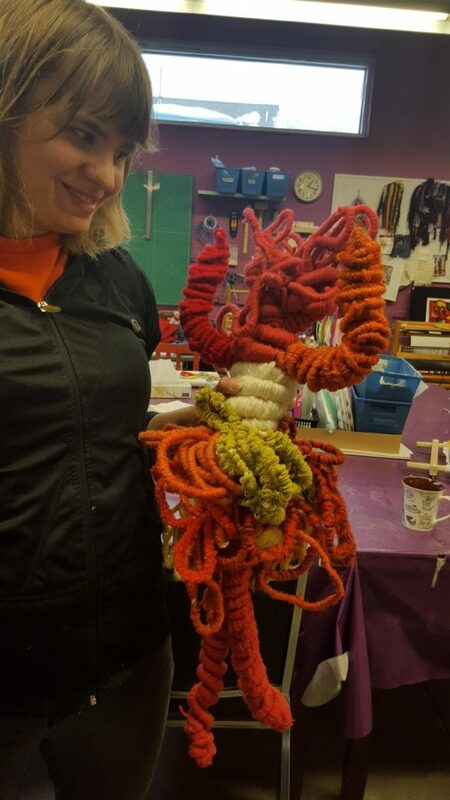 Vanessa Ryl is a textile artist who creates coiled wool sculptures. Her work experiments with shape and texture and requires a great deal of patience. Initially weaving small, conventionally-shaped bowls, she began creating free-form sculptural objects. She then progressed to making clay bowls as the base for weaving. She takes pleasure in choosing her own colours, often combining unusual shades. Vanessa continues her artistic practice outside of the Nina by cross stitching with her Grandmother. Vanessa has had success both locally and internationally. Her piece, “Seeds of Springtime” (pictured left), was displayed on a billboard in 2017 as part of YEG Canvas, and her doll sculpture was selected for exhibition in Glasgow, Scotland. In November, 2018, Vanessa will be presented with the 2019 Stantec Artist of the Year Award to celebrate her talent and achievements as an artist.